Both checkpoints were conducted late Friday. Police in Escondido arrested one person for driving under the influence of a combination of drugs and alcohol at a checkpoint at East El Norte Parkway and Ash Street, Escondido Police Lt. Michael Kearney said. 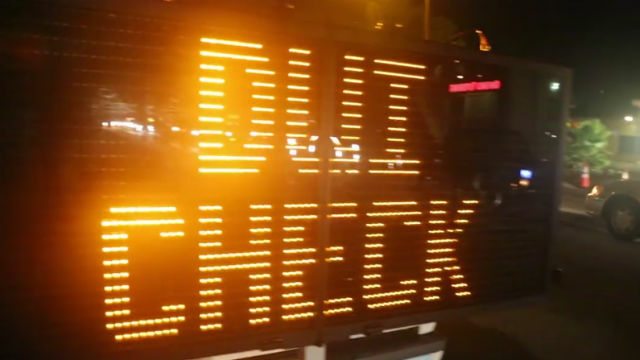 In Encinitas, one person was arrested at a checkpoint near the intersection of South Coast Highway 101 and Chesterfield Drive on suspicion of driving under the influence of alcohol, according to San Diego County Sheriff’s Deputy Brenda Sipley. Police at the Escondido checkpoint issued a total of 33 citations for various infractions including driving without a license, on a suspended license or without insurance, Kearney said. Sheriff’s deputies in Encinitas gave out 25 citations for the same offenses at that city’s checkpoint, Sipley said.